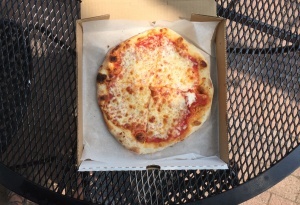 The Intern Tries…Pizza on Market St.
Ah pizza. A crowd favorite. 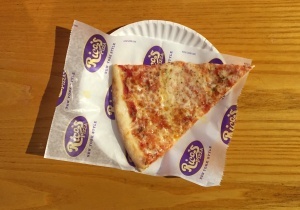 Who doesn’t love a good slice after a long day of work or a long night of drinking? Market St. has three staples. And ask anyone around, they will have their tried and true favorite. I am a huge pizza fan, but it is rare that I get to have a slice of Market St. pizza (I live in Big Flats so my go-to’s are Picnic Pizza or Pudgies). Today I decided to turn my lunch into a full-on Corning pizza extravaganza. After?globs of delicious cheese, too many carbs and waterfalls of grease, I learned each place has its own speciality and charm. Now, I have to admit, I did not grow up in the Corning area. But my parents did. I remember coming here to visit my grandparents as a kid and making special trips to Market St. specifically for Aniello’s. So this place holds a special spot in my heart. Corning folks seem to have a undying loyalty to this joint, my parents included. And there seems to be a divisiveness that immediately crops up if you suggest any other pizza place as superior. There are even arguments over how to pronounce the name (I’ve heard annie-ellos, a?iyellos and a-kneel-yos). What’s best about Aniello’s is the atmosphere. You walk in and it’s almost always packed. The crowd is diverse: workers on lunch break, retirees, families, interns eating lunch alone. And no one can deny, the pizza is amazing. Flakey crust and crispy bottom, salty cheese, not too much sauce, grease pooling when you fold it down the middle (the correct way to eat a slice). And with it’s late hours, the place just calls you after some Market St. bar-hopping. Atlas has something the others don’t: a brick oven. There are few things cooler in this world than seeing your pizza get made start to finish: the kneading, flipping and flying of the dough, the quick dressing of the sauce, the sprinkling of the cheese, and then to see it go from raw to a bubbling, crispy, gooey delicious circle of carbs is incredibly satisfying. The pizza itself was softer on the bottom with a softer crust. Overall, there was more “stuff.” More cheese, more sauce, thicker dough. It was the messiest of all the pizzas, but you cannot expect to be clean after pizza, especially good pizza. The saltiness of the cheese cut right through the sweetness of the sauce, something every great pizza should have. I’ll be honest. I’ve never been drawn to Rico’s. I’m not really sure why, but I never gave the place much of a chance…until today. And, well, I was very impressed. To find a true New York style slice in lil’ ol’ Corning was surprising. It was very thin, the thinnest of all. The cheese to sauce ratio was on point. The grease was spilling out everywhere, so much so that I had a burst of it trickle down my chin (be honest, we all love that). The stringiness on the cheese was quite impressive as pizza is just as much a visual delight as it is a tasteful one. Okay, so they all have their strengths, but which one is the true winner? If you couldn’t pick up the hints, I’ll be an Aniello’s girl til the day I die. It was a part of my childhood before I even moved to Corning; their pizza grease flows through my veins and that’s something I’m proud of. A few years back, Urban Corning’s founder Myles Lasco wrote a similar post to this one, exploring how even though Corning is littered with pizza joints, they all fill their own niche. And every Corning resident has their favorite. 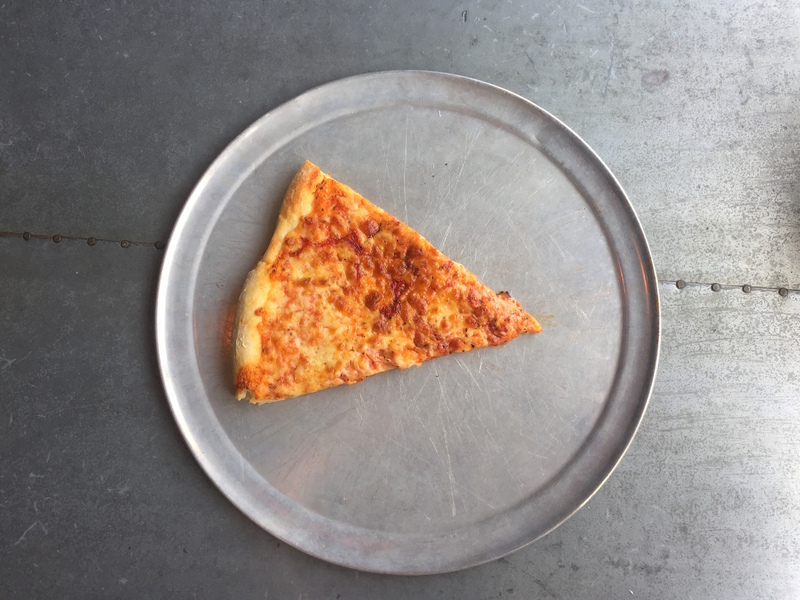 While I go fall into a pizza coma, tell us your favorite Corning slice in the poll below!